Hello lovelies, I know Easter is over and done with now but who is still seeing easter eggs all around their home? I know I am. I'm trying to loose weight, trying to stop the kids from eating too much chocolate so I just want it all gone now! What better way to get rid of the chocolate than to melt it? I mean who actually throws/gives chocolate away? Not this family. So I thought why not have a quick fun no bake session with the kids after school today, Oscar loves making cakes, I am no Mary Berry, I can't even get the box pre made cakes right, so what better excuse than to make chocolate rice crispie cakes? Melt all those chocolate eggs or any left over chocolate you have lying around. Any cereal will do really but I happened to have rice crispies close to hand. Mix the mixture until the cereal is covered in the melted chocolate. 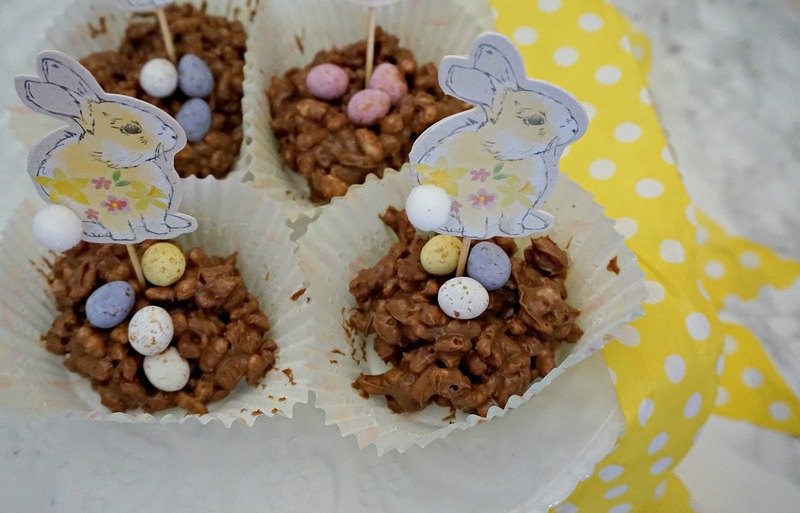 Place the mixture into cute cup cake cases, stick in a rabbit for good measure. VOILA! Oh you could even add mini mini eggs, standard mini eggs or sprinkles to jazz it up. You could even make these bad boys for Halloween just add gory sweets and food colouring. It maybe super simple, it doesn't look Pinterest worthy but they tasted amazing, happy mother and happy kids. If you have any no bake bake recipes PLEASE let me know as I am a total fail at baking.